Jewelry maker Melissa Evans was just trying to help out her sister when she made her first cork bracelet. Her sister is vegan, and wanted a piece of jewelry made with faux leather. Evans, owner of Gem Lounge Jewelry, says faux leather “can be tricky. A lot of times it can include some substances you might not want.” Evans had owned a Natalie Therése handbag made of cork and decided to give the material a try. She made a few vegan leather bracelets with it, “and the response was amazing.” Not only did her sister want more, so did her sister’s vegan friends. The bracelets can be worn in the shower, or while doing dishes. Evans, who works out of a studio in Raymond, keeps hers on when she goes for her daily swim in Little Sebago Lake. The color holds up well in water, Evans said, and the cork becomes softer. Cork strips are used to make a lot of products, including handbags, shoes and belts. The cork Evans uses is harvested from cork oak trees in Portugal that can live to be 200 years old. The cork is stripped from the trees every nine to 12 years, according to Evans, and harvesting does not damage the tree. The supplier she uses dyes the strips for her in 15 different colors. Then she stitches and sews them into her own designs. Evans’ bracelets can have magnetic, silver or copper clasps, and are easy to put on and take off by yourself. “We try to be a green company,” she said, “so all the metals I use are genuine metals, and they’re all recycled.” Evans sends all her scrap metal back to the manufacturer, where it’s melted down again. All of her jewelry boxes, gift cards and other packaging are made from recycled materials as well. The bracelets, which cost $40-49, depending on the style, can be easily cleaned, if necessary, with a little dishwashing liquid, she said. She’s also developing a new line of bracelets adorned with handmade porcelain beads. Those cost $65. 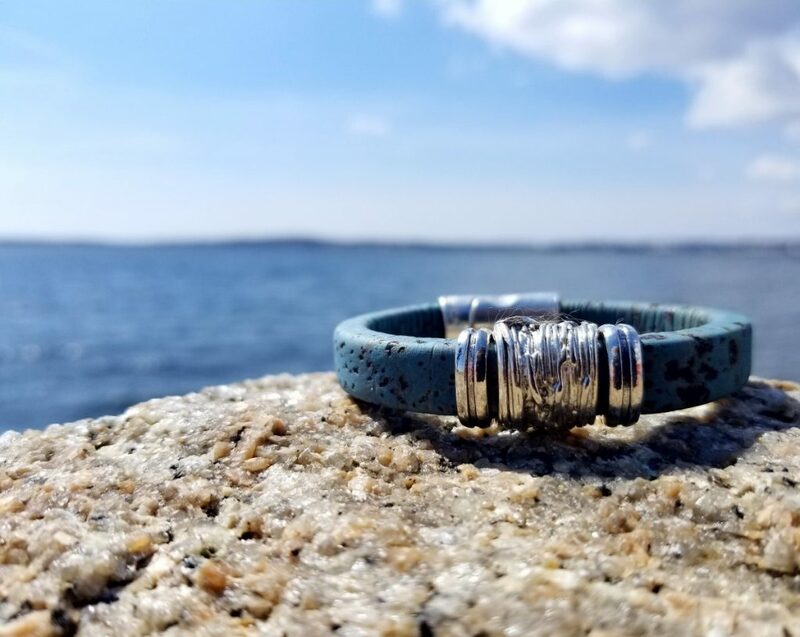 Evans sells her bracelets in about 75 stores around the country, including many in Maine. To find a local retailer that carries them, go to gemloungejewelry.com and type in your zip code.